Application: Hi-sea Marine supply all kinds of marine equipment which including marine deck equipment,marine propulsion equipment,marine m,mooring equipment,marine outfitting equipment,marine auxiliary machinery and so on.Besides,marine and offshore equipment,we Hi-sea also can supply fishing products like fishing chain,fishing net and fishing float.Our company supplies PVC, EVA, PE, EPS floats which are all made of high quality material and have a large variety of specifications, shapes and colors. 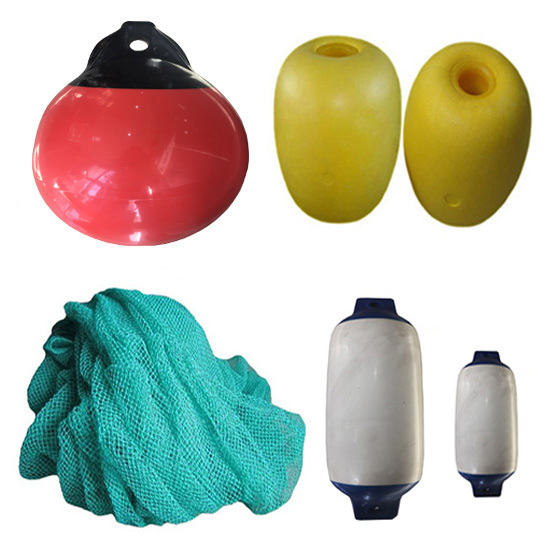 Our fishing net floats are widely applicable to fishing and aquaculture.Also we can provide our customer high strength round link fishing chains, including short link chains, mid link chains and long link chains. Our fishing chains are made of high quality alloy steel/stainless steel, which have high tensile strength and smooth surface.Moreover,Fishing net is one important fishing gear for fish catching and breeding. To meet our customer’s different demands, we supply various types and all specifications of fishing nets such as seine net, purse seine net, trawl net, fixed net, cast net, gill net and so on. If you’re interested in our fishing floats, please feel free to contact us. We’ll give you a reply as soon as we could.